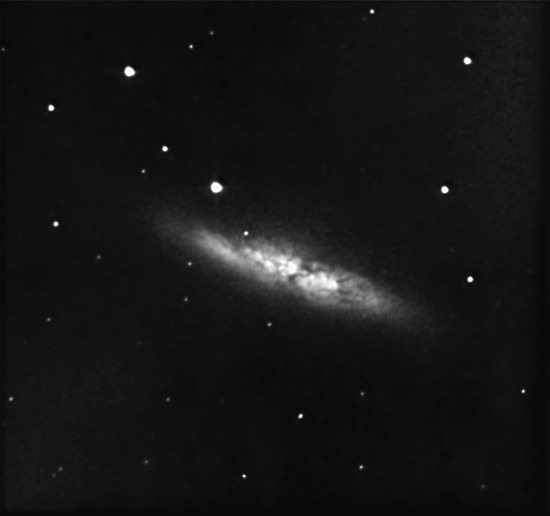 Here is my first image this season of M82 - one of my favourite galaxies - one that I return to fairly often. IT was a bright moonlight night, so it was impossible to image dim objects, so I decided to go for this nice bright galaxy. M82 was only starting to creep up into the nice part of the sky - it was a school night, so no late night marathons for me. Turned out "not bad" in the end. Needs more longer frames under better skies. I had debated whether or not to do anything last night with the moon so bright, so, as is the case, some image is better than no image. Mind you, not sure whats going on with the starshapes. This image turned into an exercise in playing with Maxim DL. The image was captured in Artemis Capture (I trust Artemis capture you see, I haven't learn to trust Maxim yet) and then calibrated (see, I'm turning into a proper imager now, not only did I take flat field frames, I refer to their application as calibration!! *grins*), stacked and lunar gradient removed in maxim. I used photoshop to play with the curves (more familiar with the tools in photoshop!) and returned finally to maxim for a bit more of a play. The top image shows the final "pretty" result. I then experimented with some deconvolution in maxim producing the bottom image. This result, is, urm, interesting to say the least! Bit of a mess, but some cool details coming out of the galaxy. Mind you, they could just be image processing artifacts! For comparison, here is a much nicer shot with my SC3 camera from last year. I still have some catching up to do!